2018 Cetis new products review. Click on the "Read More" link on the image below to view new products. Cetis announces that Teledex and TeleMatrix brand VOIP telephones have formally completed interoperability testing with BroadWorks. The telephones are now interoperable with the BroadWorks SIP interface. The testing covers the Cetis versions and BroadWorks release listed below. Other versions tested previously are documented in the PCG. 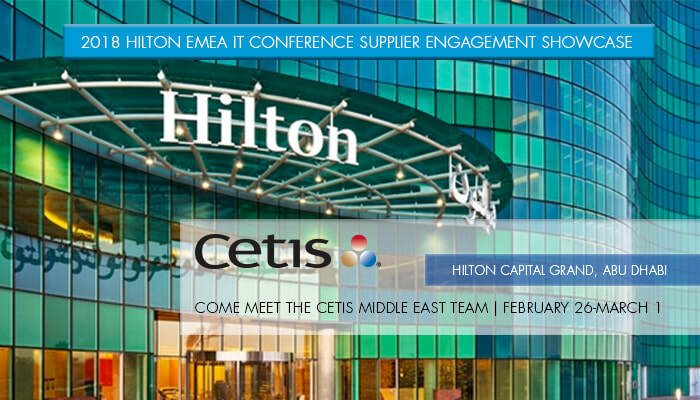 Cetis Middle East exhibits at Hilton EMEA IT Conference. Cetis Middle East demonstrates new Cetis products at Hilton EMEA IT Conference and Supplier Engagement Showcase. The Cetis Middle East team is exhibiting the latest Cetis telephony and USB charging solutions at the Hilton EMEA IT Conference in Abu Dhabi held at the Hilton Capital Grand, February 26-March 1. Conference attendees include up to 20 members of the Hilton IT Leadership Team (CIO/CTO and Functional Heads), and 200 Hilton EMEA Hotel IT Field Services Leadership & Operations Team members. ​Click here to submit a request for a Cetis Middle East team member to contact you, or here to book a room at the Hilton Capital Grand hotel in Abu Dhabi. The answer is "yes"! More than just a telephone, Teledex M Series hotel phones are an integral component of a contemporary guest room, connecting guests via Bluetooth to place and receive calls and stream music, to charge smart devices via built-in USB ports, and now to monitor time and set wakeup calls via a new Teledex M Series Clock digital clock upgrade option. Accept no substitutes. Specify innovative Teledex M Series phones with contemporary dual-facing cordless handsets to help ensure a positive guest experience, and return bookings. The most popular cordless hotel phones in the world. 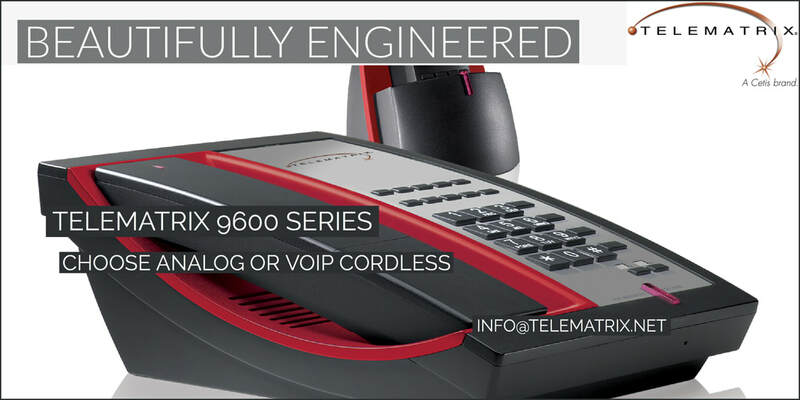 Still the most popular cordless hotel phones in the world, TeleMatrix 9600 Series features AutoSync handset pairing, OneTouch voice mail message retrieval, 7 standard or custom handset color insert options, and much more. Click here to view handset color options, here to explore product details, or here to request a quotation for your next new construction or renovation project. Take charge of your guest experience. Guests are bringing more smart devices than ever when they travel. Make sure that your property is equipped with easy-access charging options. 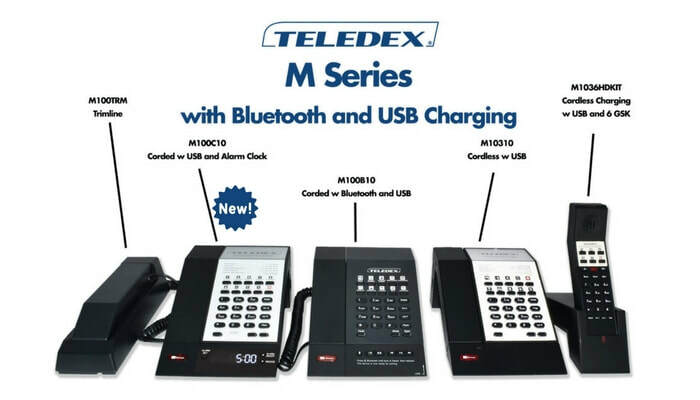 Choose from Teledex M Series, E Series, and D Series telephones with built-in USB charging ports, or USB Series UCD100 universal charging attachments. 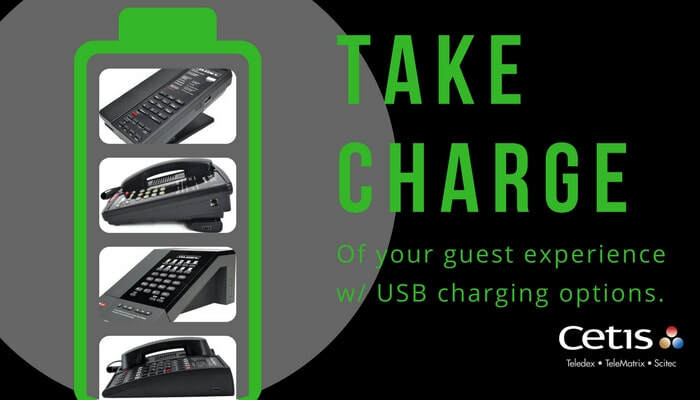 Now take charge of your guest experience with convenient, affordable Cetis USB guest smart device charging solutions. Click here to request a quotation. Today, virtually all travelers (95%!) read reviews before they book their accommodation. Today, virtually all travelers (95%!) read reviews before they book their accommodation. Major review sites such as TripAdvisor along with niche travel blogs, forums and social networks are all frequently consulted, each inspiring, informing and influencing where people choose to travel and stay. While firming up plans, a lot travelers also visit the hotel website to conduct more research and check rates. But while a lot of hotels spend time nurturing social proof on third-party review sites, many neglect to do so on their own website, which is a major missed opportunity. Travelers often head to the hotel website at a pivotal point in their buying journey. It’s a place where cementing trust and conveying value can influence the final booking decision, where a glowing testimonial from a past guest can tip the balance in your favor. How can hotels do better here? In the following article, we’ll describe the forms of social proof that are especially useful for hotels, and provide tips on how to integrate them directly into your website to boost conversions. The power of online reviews can’t be overstated. According to a recent study by BrightLocal, 85% of consumers trust them as much as personal recommendations. Clearly, getting lots of positive online reviews is great. But you can squeeze even more out of them by integrating them into your hotel website. Sites such as Yelp make it easy to embed reviews from their site into your own with a simple line of code. TripAdvisor offers a similar service, enabling customers to showcase reviews, ratings and photos through their TripAdvisor Widget Center, while TrustPilot also features an embedding tool in the form of their TrustBox Library. Another social trigger with big influence is Google’s review stars. You’ll often see these stars beneath a search result on the Google search results page, and their persuasive power is also substantial—TripAdvisor along with many of the major OTAs already feature them within their Google search result. 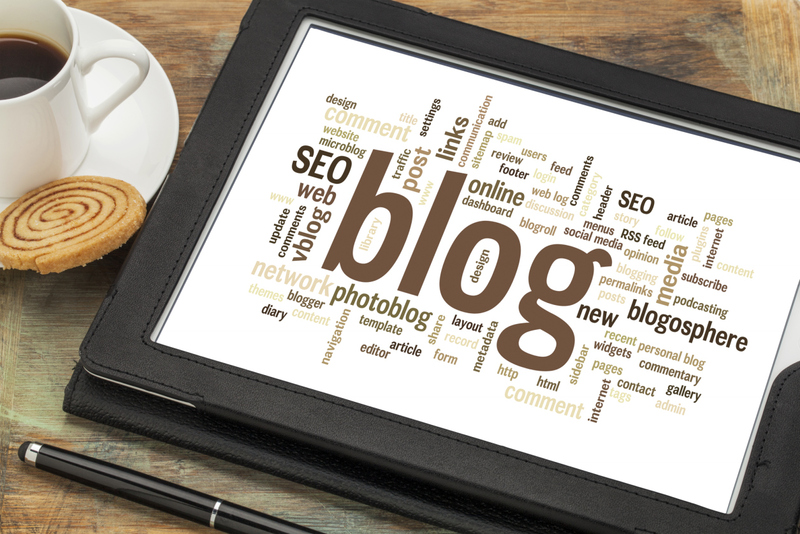 A study by ConversionXL found that stars on a search engine result listing boosted traffic by 35%. By integrating reviews into your own hotel website, you can also get your star rating to appear on your Google listing as well. If you’ve found a handful of especially positive testimonials on a review site, you can make them work twice as hard for you by prominently featuring them on your website. A small selection of comments can quickly give potential guests added reassurance that your hotel is perfect for their needs. In particular, testimonials have been found to be most effective when they’re accompanied by a photo of the reviewer. In another user experience test by ConversionXL, they found that “testimonials with photos were significantly more effective at generating viewer recall than testimonials with no photos.” So while words alone are powerful, photos add credibility to comments and are more likely to be remembered.